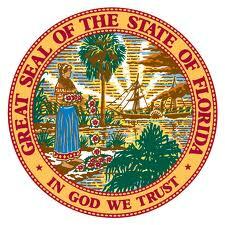 n 1985, Secretary of State George Firestone presented the revised Great Seal of the State of Florida to the Governor and the Cabinet. The previous State Seal had several errors which were corrected in in the 1985 Seal. This revised Seal has a Seminole Indian woman rather than a Western Plains Indian, the steamboat is more accurate, and the cocoa palm has been changed to a sabal palm as the Legislature prescribed in 1970.